No one likes to be late, especially for deadlines and paying bills. B-Dirt Construction LLC, knows that staying on task and being financially responsible are a reflection of character. We keep your project on schedule by making sure all suppliers and sub-contractors are paid on time. We want to be known for outstanding character as well as outstanding homes. When you work with B-Dirt Construction LLC, you’ll soon realize that you’re in a relationship—with all of us. We have over 25 skilled employees that build our custom homes. From roof to foundation, every detail is made with outstanding craftsmanship. But before you get that far, we’ll provide a preliminary design and price total, all at no cost to you. And if B-Dirt Construction LLC is building a new home for you—and you need a place to live—we’ll set you up in a townhome (if available), rent free, until your project is complete. And now you know why we’re different. It’s because we care not only about your project, but also about you. Get what you want. Your building ideas, lifestyle and personal tastes all go into creating a home that is uniquely you. At B-Dirt Construction LLC, we take all of those components and project them for you in a visual way. Utilizing the latest 3-D software, we can make your vision come to life, before lifting a single board. Changing interiors and exteriors, colors and materials, all help refine your home. We take out the guesswork, so ultimately, you get what you want. It’s all in the technique. How we build our homes is key to our success. 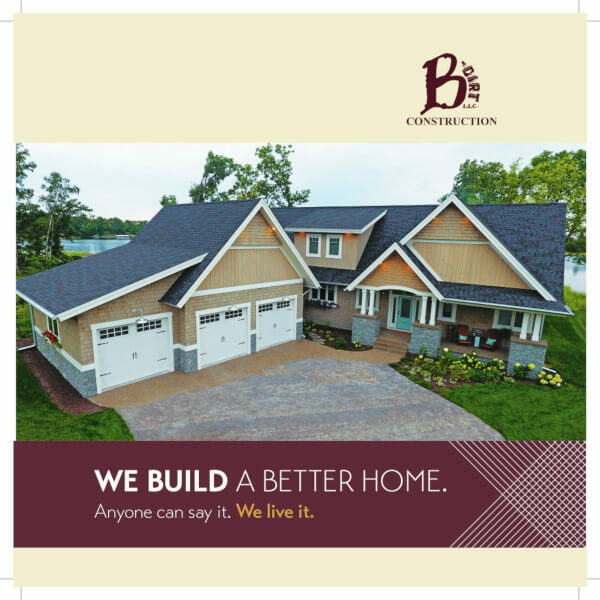 Here are just a few ways B-Dirt Construction LLC stands apart from other builders. Many builders in northern Minnesota use block or poured cement basements. These methods can leak, and are not energy-efficient. B-Dirt Construction LLC uses Insulating Concrete Forms (ICF). These are interlocking modular units that are dry-stacked and filled with concrete. We add pre-engineered rebar to the ICFs to reinforce their strength. The forms are left in place which greatly reduces heat loss. Another B-Dirt Construction LLC difference is that we use blown-in blanket insulation in our walls, not R-19 fiberglass batting. This not only provides an R-24 value, but it fills in all the hard-to-reach areas in the wall cavity. We go to the trouble of insulating your home—really well. So why not heat it equally as well? B-Dirt Construction LLC installs dual-heat systems that allow you to not only switch between gas or electric, but you also receive lower kilowatt rates at most local utilities. You know that your home will be well-built, well-insulated, and well-heated. Finally, put your mind at ease knowing that its exterior is also of the best quality. James Hardie cement board siding has won numerous awards for its durability. It is resistant to rain, wind, snow, sun and hail. Only the best for B-Dirt Construction LLC clients. Making your vision come to life. Your building ideas, lifestyle and personal tastes all go into creating a home that is uniquely you. At B-Dirt Construction LLC, we take out all the guesswork, so ultimately, you get what you want.